Cookies for breakfast! 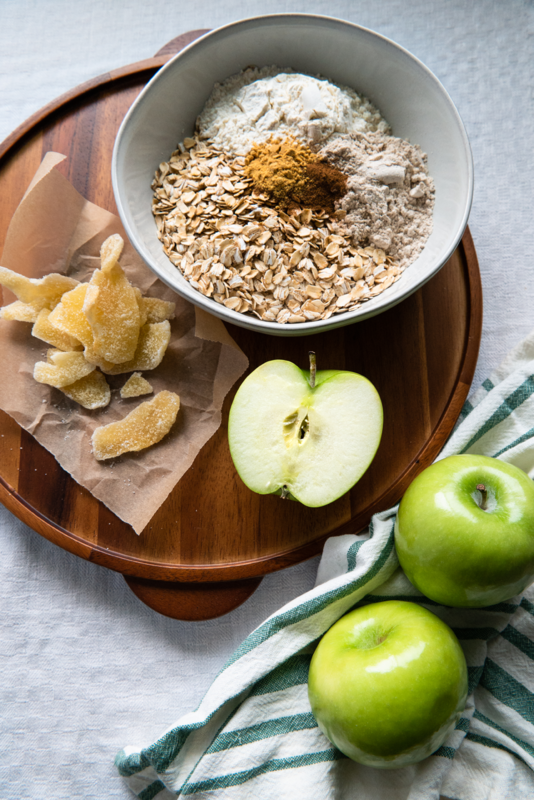 Nothing beats these chewy, oat-filled apple cookies first thing in the morning. They’ll also readily find their place in a lunchbox or a picnic basket. 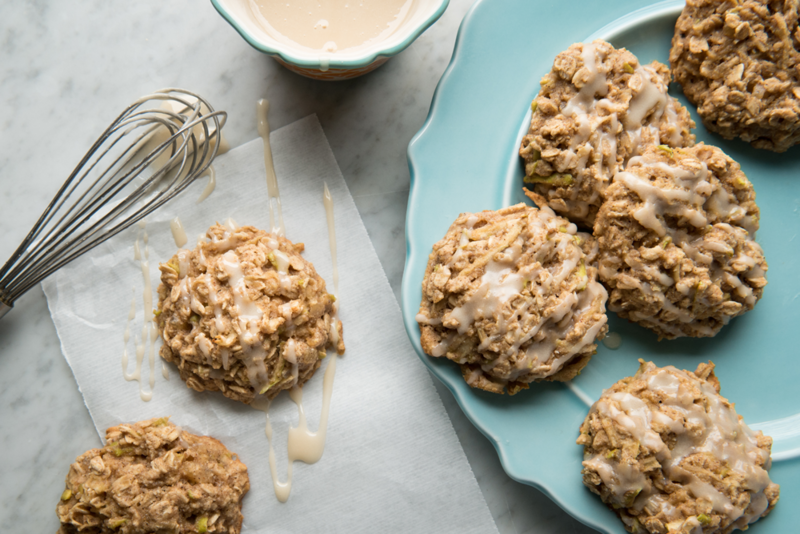 We loved how the Granny Smith apple added moisture and just the right touch of acidity to the cookies. You can of course substitute them for your favorite variety of apple. Crystalized ginger gives these oaty devils a kick but can be omitted to make them more kid-friendly. This recipe can be adapted to suit vegan or other dairy-free diets. Refer to the notes at the end of the recipe for specific instructions. In a medium bowl combine the dry ingredients: oats, all-purpose flour, oat flour, baking powder, ground cinnamon, ground ginger, and salt. In a small bowl, mix the wet ingredients: maple syrup, melted butter, and vanilla extract. Pour the wet ingredients into the dry and mix until everything is combined but take care not to overmix. Stir in the apples and crystalized ginger if using. Let the batter sit for 10-15 minutes while preheating oven to 325°F / 165°C. This will give the oats time to soak up some of liquid and make for moist cookies. Spoon batter onto the lined baking sheet one heaping tablespoon at a time, then bake in the oven for 12-15 minutes, until lightly browned around the edges. While the cookies are baking, make the glaze. Thoroughly combine the powdered sugar, lemon juice and vanilla extract. Then add milk 1/2 tablespoon at a time until consistency is fluid but not runny. You may not need all of the milk. Take the cookies out of the oven and transfer onto a wire rack to cool. Drizzle the glaze over the cookies in a zigzagging motion using a spoon. Let the glaze set, about 5 minutes, then serve. * These types of flour can be found in health food stores or the health food/gluten-free aisle in supermarkets. They can also be ordered online.